Bout of Books 23 has ended but the fun doesn't stop until the Grand Prize Winner is announced! Emma's winning entry came from following Kelly Apple on Twitter. For those that are interested in helping out for the next Bout of Books, we post a call for help roughly a month prior to the start of the read-a-thon - which will be around December 10th for Bout of Books 24. Keep an eye on this blog for that announcement. You can also follow the Bout of Books Instagram account where we countdown the weeks until the next Bout of Books or join the #boutofbooks-ers Facebook group to talk books between read-a-thons. Once again, thank you to everyone who helped make Bout of Books 23 a success! We appreciate that you love books and how vocal you are about sharing it! Bout of Books is known to add to your TBR instead of reduce it. Embrace it by sharing the books you've discovered through Bout of Books. Thanks to Erica (@2020hines_sight) for today's challenge. Thanks to Emma (@emmareadsthings) for today's challenge. Welcome to Bout of Books 23! 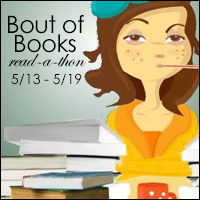 For Bout of Books 23, all challenges will be hosted on the Bout of Books blog. Here. Right here. So keep your eyes on this site to see what's what for the day!